There are some beautiful beaches by the Mediterranean Sea that look nothing like what I’m familiar with in America. The Atlantic side of Florida has large beaches, odd things–think garbage and such–washed up on shore. And lots of people with lots of things accompanying them. As we walked along a beach in southern Spain, we saw fewer people with fewer things. The rocky outcroppings looked almost like giant sculptures. Terraced and smooth in some places. Rough and random in others. Truly spectacular. 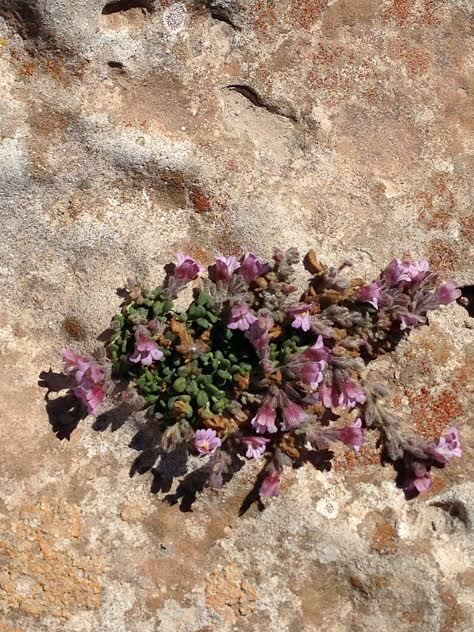 What was most amazing were the beautiful flowers growing right out of rock. Not a hint of dirt to be seen. Those are my kind of flowers. I have a knack for killing green things. Even using great soil, fertilizer and careful watering, my attempts at gardening often resemble an abandoned field in the midst of draught. But here were flowers blooming joyously in rock. Under a blazing sun. Where the closest water source was of no help to them whatsoever. You’ve gotta love those things in life that have that kind of resilience. Me? I’m more the fragile greenhouse flower. I need some pampering. A little TLC. Not that I always get it. Who does? We may want things to work out for us in pleasant ways.To not suffer or be in pain or discomfort. That isn’t life.Life is hard. Not harder. You can’t grade hard life issues. We’re each dealing with things that challenge our ability to cope every day. If you’re not in a difficult life situation right now, give it a bit. It will come. It’s like we’ve each been given a backpack full of life challenges we need to deal with. As much as I complain about how heavy mine is, gripe about how burdensome it feels, I’ll never want to switch it for someone else’s. And no one wants mine. 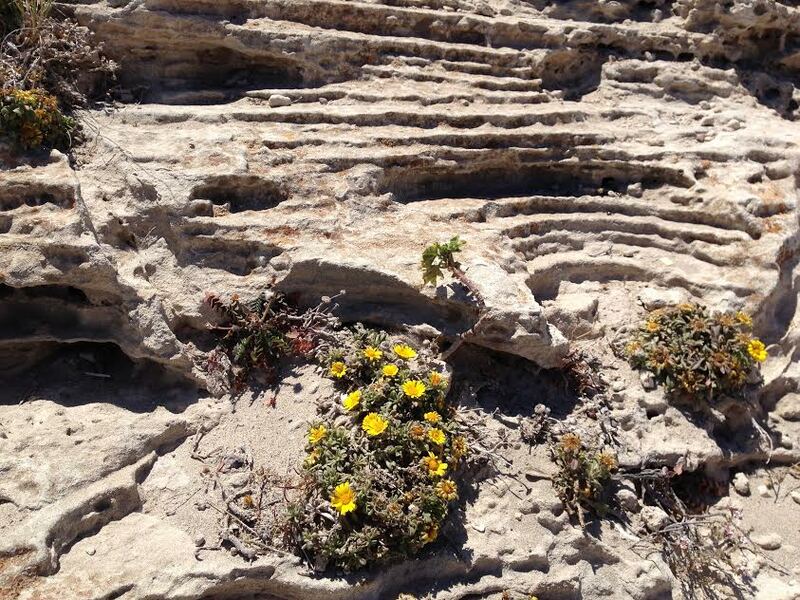 How can I be like those flowers blooming in rock? Defying the reality of my circumstances and being more than a victim? More than a statistic? I know that God is on this rock with me. He gives me the capacity to bloom. When Israel–a picture of all of us–was struggling with the consequences of not following their God, He didn’t abandon them. He paid the price for us so that we might not be destroyed by our life circumstances. That we might bloom in spite of them. In light of them. Life will always be hard. But it can’t keep you from becoming what God intended you to be. If you trust Him. Posted by daylerogers on May 5, 2014 in Uncategorized and tagged Atlantic beaches, beaches, blooming, challenges, gardener, God, Mediterranean Sea, southern Spain. I love this: “You can’t grade hard life issues”. Very well said. Rocks are hard. Life is hard. But flowers still bloom there… And I can too. Thanks for the great reminder as I enter the week! Thanks, sweet friend. I don’t know why I’m ever surprised that life is hard. But I love how God reminds me daily–especially if I’m alert enough, smart enough to look for it–that He alone makes life bloom. And Dayle, thank you for writing this for me. 🙂 I couldn’t help thinking when I read this, that God is my Rock, my Fortress. I can bloom when I’m rooted in Him. And yes, my “backpack” feels heavy right now, but Jesus knows that. And He’s giving me strength. Life is hard. You’re living it in a way I’d never choose. But I stand amazed at how you do it, how you do today and prepare for tomorrow. Not because it’s easy but because you’ve chosen to do it the best way you can. I love how He gives you strength. Well said, Dayle. Very well said. Thanks, my friend. I know you’ve experienced this truth more than most. I value your commitment to blooming. Period. There’s something about when the “water” and “good soil” aren’t there that I’m forced to trust God more and growth takes place! Hopefully then the “flowers” of my life are more beautiful. Was with a friend today who is in just such a spot right now. I can already see some beautiful “flowers” emerging. BUT, I don’t look forward to those places, I can only trust a loving, sovereign God to know when to bring them! You are so right, my friend. Those hard places aren’t ones to anticipate but times when we can learn and anticipate God. I’ve gotta admit–not a fan of the hard stuff. But I know it’s for my good. It’s good to be reminded that even in the desert there is beauty. Thanks so much for your encouragement, Betty. I’m grateful.